Nepenthes fusca has long very cylindrical pitchers with a slightly flared peristome. They seem to be very similar to N. maxima except more elongated. As with N. maxima, there are many variations available. 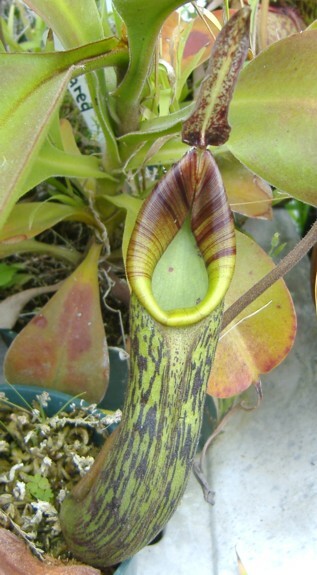 The lower pitchers have the most color while the upper pitchers tend to have greener tubes and a little striping in the peristome. For me, N. fusca can be more of an intermediate grower than a highlander depending on which clone I have. My California Carnivores clone does well through my winters and can tolerate lower temperatures. However, I've had some other N. fuscas that didn't do well through winter and died. This species is a climber and really takes off once into the climbing stage. It's easy to look after and a species I think sometimes gets overlooked compared with other Nepenthes species.